Approx 80g of custard colour DK (I used crepe) for the main beehive and small amounts of colours for the flowers, bees and door. Some stiff but flexible plastic or card. Stitches used are Magic Ring, Chain, Treble (US DC), Half-Treble (US HDC) Double Crochet (US SC), Slip stitch, DC decrease, Tr Decrease. The chains at the beginning of the round count as 1 Tr or 1 DC depending on the round (that should make sense as you go). 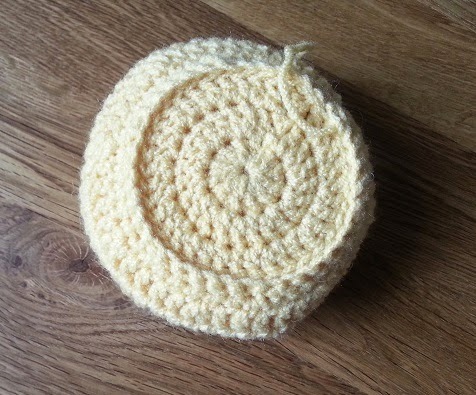 Finished item measures approx 15cm high by 17 cm across. 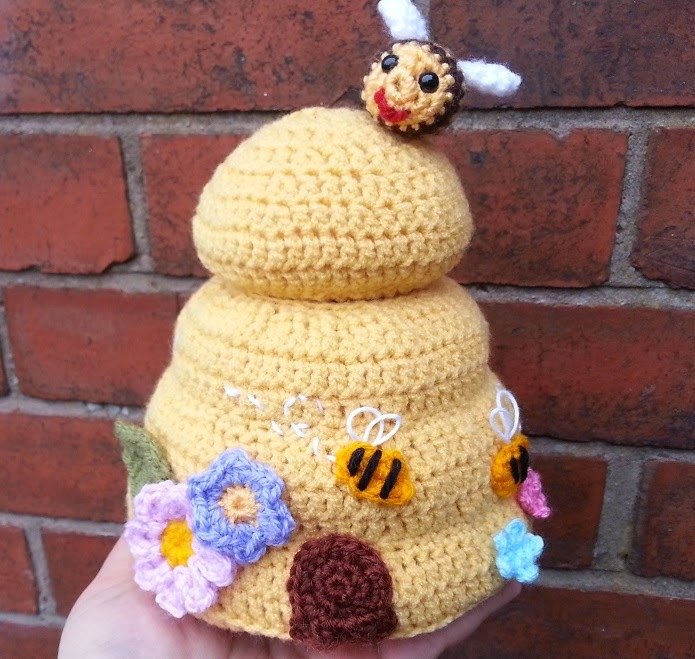 I have not included the pattern for the big bumble bee on the top of my first Beehive as it isn't mine but can be found here. OK, I think that's everything, so the pattern! Chain 3 and crochet 11 Trebles (Tr) into the ring. 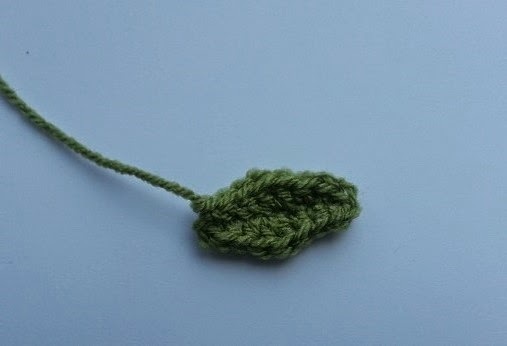 join with a slip stitch to the third chain of the initial chain 3 to join the round. Round 9 - WORKING OUT OF BACK LOOPS ONLY - Chain 3, 1 Tr in each stitch around, join with a slip stitch to the 3rd chain of the initial Chain 3. Round 10 - Working out of both loops for this round and all rounds from now - Chain 3,1 Tr in each stitch around, join with a slip stitch to the 3rd chain of the initial Chain 3. Fasten off and sew in the end to secure it. Sew in the end from the magic ring in the base to secure that too. Round 1 - Start by making a magic ring. 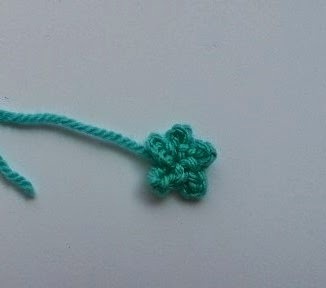 Chain 3 and crochet 11 Tr into the ring, join with a slip stitch to the third chain of the initial chain 3 to join the round. Now get your plastic or card and measure a circle big enough to fit the base of the Beehive, I do this by taking a peice of paper folding it into a point (by folding it in half, in half again and so on) and holding it against the base. Cut the paper to size so it fits snuggly but not too tight (along the black line in the above picture), we don't want it to warp the base by being too big. Now place this against your card or plastic and cut around it. The card or plastic should now fit into the bottom of the Beehive, it should be flexible enough to be able to bend through the opening. Please make sure there are no sharp or pointy edges if using plastic. Now cut a strip of card or plastic to fit around the inner bit of the Beehive. It should be approx 9cm by 22 cm. Stick it together into a tube with lots of sticky tape. It should all fit together nicely like this. Start stuffing your Beehive, getting right into the corners. Don't stuff it too firmly or it will squash the middle of the Beehive. Carry on stuffing as you go from now on. 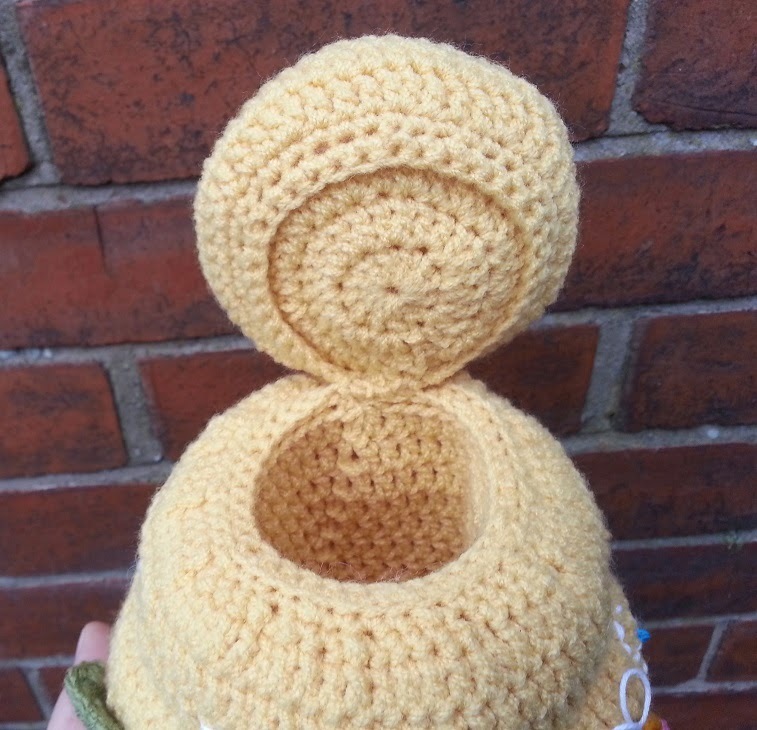 Now as we didn't fasten off from making the Inner Beehive we can go straight ahead and crochet the inner piece to to the outer piece. 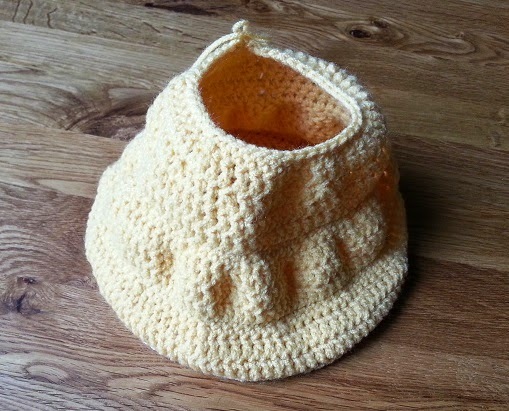 There are 42 stitches at the top of the outer Beehive and only 36 at the top of the inner beehive. this means we need to decrease the outer stitches by 1 every 6 stitches. 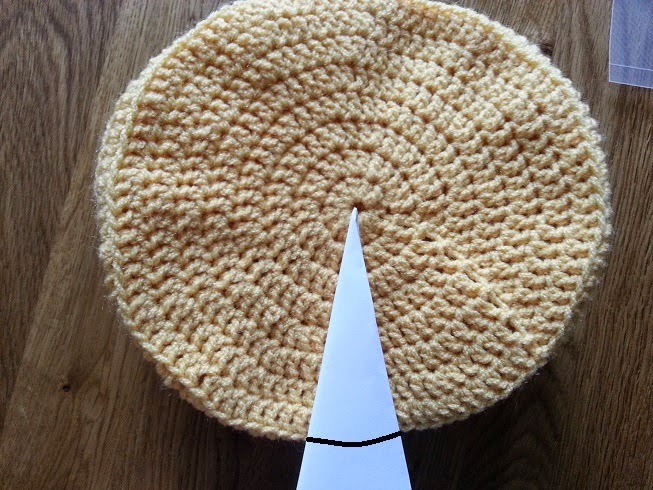 you can do this simply by skipping every 6th outer stitch or by putting your hook through the inner stitch, the next outer stitch and then the next outer stitch again, yarn over and back through the inner stitch, yarn over and through all loops on hook. Alternatively you can fasten off the inner piece and sew it in place. Sew any left over ends to secure them in place. Round 1 - Chain 43, DC in second chain from hook and each Chain along, Bring the end of the row around so you can slip stitch into the first DC, making a circle of 42 DCs. Round 8 - Chain 1 *DC decrease* repeat this all the way around, join with a slip stitch to chain at the beginning of the round. Fasten off. Sew in all the ends and if you have a gap at the top of the lid (after Round 8) put a couple of small stitches in it to close it neatly. 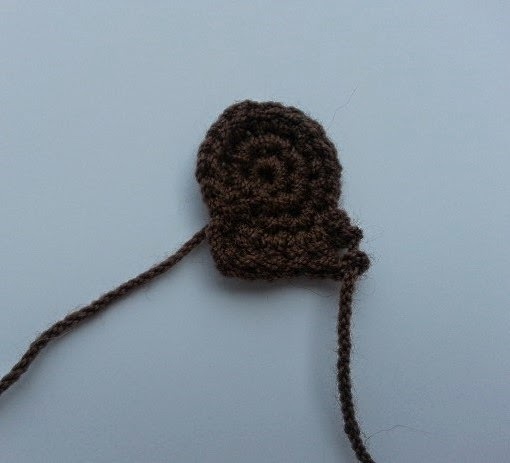 Do not fasten off but crochet this piece to the rest of the Beehive lid that you have just made, in the same way that you attached the inner and outer main Beehive. Alternatively, sew them together neatly remembering to stuff the lid as you go. For added structure cut out a small circle of card/plastic and insert it at the base of the lid. 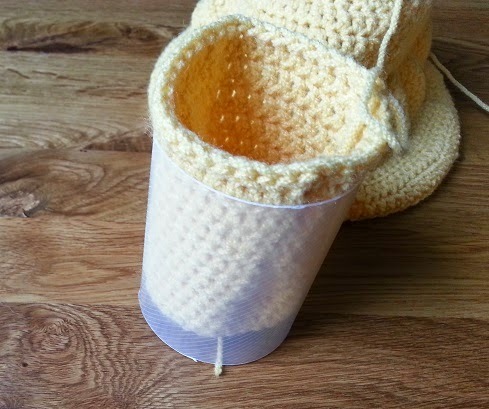 Now simply attach the lid with a few stitches to the main body of the beehive. Round 1 - Make a magic ring, Chain 1 and make 6 DC into the ring, join with a slip stitch to the first DC. Round 4 - Chain 2, 1 Treble in the next stitch, 1 Htr in each of the next 2 stitches, 1 Tr in each of the next 2 stitches. Fasten off, sew in the ends neatly and sew onto the beehive. With bright yellow yarn, chain 4, DC in 2nd chain from hook, 2 HTr in next Chain, 1 DC in last chain. Chain 1 (and working on the other side of the initial chain row), 1 DC in the next Chain, 2 HTr in the next Chain, 1 DC in the last Chain. Fasten off and secure the ends neatly. 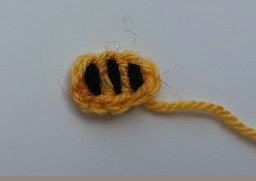 With a small amount of black yarn sew 3 stripes onto the bee. Make a Magic Ring, *Chain 5, slip stitch into the ring* repeat this 5 times, fasten off, pull the ring closed and secure the ends. Chain 8, 1 DC in the second chain from hook, 1 HTr in next 2 Chains, 2 Tr in next Chain, 1 HTr in next 2 Chains, 1 DC in next chain. Chain 1 (and working on the other side of the initial chain row) 1 DC in the next Chain, 1 HTr in each of the next 2 Chains, 2 Tr in next Chain, 1 HTr in each of the next 2 Chains, 1 DC in the last Chain,. Fasten off and secure the ends neatly. 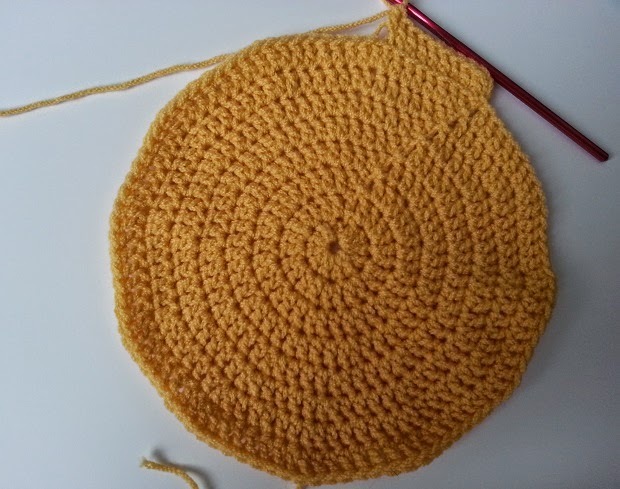 With yellow make a magic ring, Chain 1 and crochet 6 DC into the ring, join with a slip stitch to the top of the first DC. Fasten off. 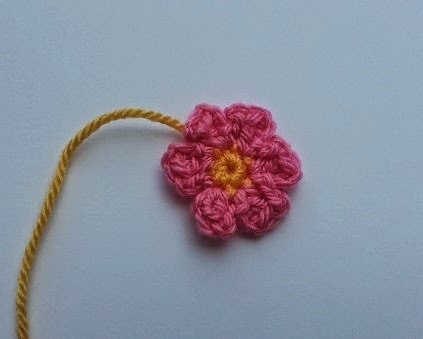 Change colour by drawing up a loop of the new colour through the first DC, *Chain 3 and 1 Treble into the same stitch, Chain 3 and slip stitch into the next stitch* repeat this 6 times (6 petals made) and join with a final slip stitch into the base of the first petal. Fasten off and sew the ends in securely. Your beehive should now be coming together with the lid attached and the door in place. Add as many bees, flowers, leaves or whatever you like to prettify it. 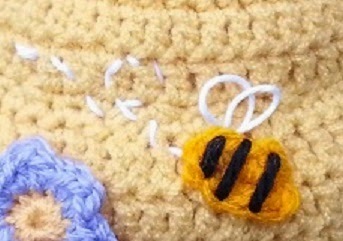 Before I placed my bees I used thick white cotton thread to create a loopy running stitch and then made two loops at the end (for the Bees wings) and then sewed the body of the bee on top. This pattern took quite a few bleary eyed hours to write up and I may well have made a mistake here or there, if you spot one please let me know and I will endeavour to correct it. 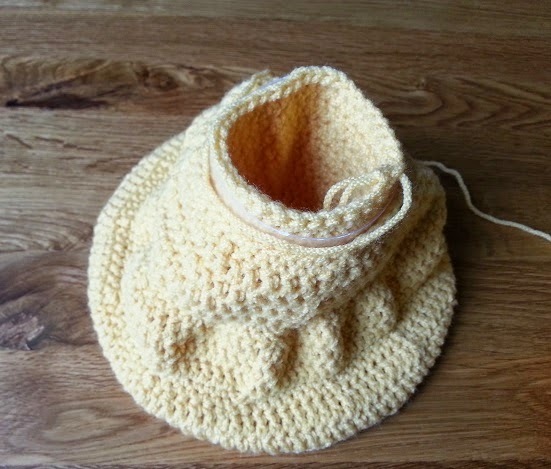 Please also leave me a comment if you try this pattern as I would love to know how it turned out. Happy hooking!